The Europeans in antiquity knew very well that they were descended from Noah’s son Japheth, and they recorded that lineage in documents that are still available today. That’s the premise of After the Flood: The Early Post-Flood History of Europe Traced Back to Noah, by Bill Cooper (Chichester, England: New Wine Press, 1995). Cooper uses ancient sources to reconstruct the royal lineages of the early Britons, Anglo-Saxons, Danes, Norwegians, and Irish Celts back to their descent from Japheth. Among Cooper’s sources are documents that are much-reviled by mainstream scholars because they contain some accounts that appear to be based on myths and legends, because they have their origins in stigmatized Welsh sources, but most of all because they take the Bible’s account seriously. Anything that connects to Bible chronology and historical accounts is deemed to be a ‘pious fiction’ made up by Christian monks. Although some of the complaints against these sources might have some substance, Cooper makes some good arguments in defense of these sources, which include Brut Tysillo, Nennuis’ Historia Brittonum (History of the Britons), and Geoffrey of Monmouth’s Historia Regum Britanniae (Histories of the Kings of Britain). One very useful step Cooper takes (page 40) is to correlate the various Indo-European branches that recognize a (usually deified) Japheth as an early ancestor. This includes Iapetos of the Greeks, Pra-Japati (Father Japheth) of the Sanskrit Vedas, Jupiter (or Iu-Pater, Father Jove) of the Romans, and Sceaf (pronounced sheaf or shaif) of the Saxons. Cooper does some interesting analysis to show that the relevant documents should be given more credence than does mainstream scholarship. One important result of his work is to demonstrate that the ancient Celts were literate and had a highly-sophisticated civilization long before the Roman conquest of Britain. Bibliophobic scholars don’t like to admit this, as I mentioned before, because an advanced culture among the Celts would lend support to the original documents collected and transcribed by Nennius, Geoffrey, and Tysillo. The ancient sources analyzed by Cooper extend British history back to the 12th century BCE. According to these sources, the Britons take their name from Brutus, a royal of Trojan extraction who, at that time, traveled from the Mediterranean and colonized Britain. Geoffrey of Monmouth and the Welsh chronicles give a detailed genealogy of the early British kings, which Cooper summarizes in pages 69-82, showing that there is no reason why British history has to be a blank page before 55 BCE. These chronicles correlate with other sources at several points. As is the case with many historical sources, the documents Cooper consults are rendered more plausible by their apparent contradictions. Certainly in many cases, such contradictions can be resolved by understanding the points of view of the original authors. The important point, though, is that when two different historical accounts are at variance, it shows that their authors did not collaborate or base their accounts on each other’s. In spite of Cooper’s fundamentalist leanings, his reader has to endure very little soap-boxing. His analysis is affected by young-earth creationism, and he does diverge into some speculation about ancient accounts of dinosaurs and the possible historicity of Beowulf. Not that these aren’t interesting topics — it’s just that his best work is his extraction of genealogies from the various ancient Indo-European sources, and their connection back to Noah’s son Japheth. 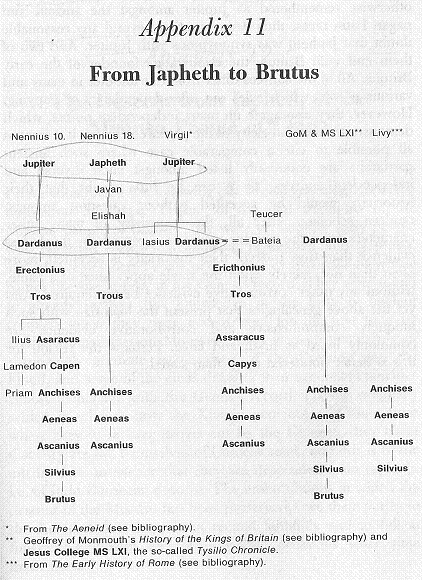 Following is just one example of many of the useful and fascinating genealogical charts Cooper includes in his book, in this case showing the connection and correlation of the descent from Japheth to Brutus according to Nennius, Geoffrey, and Virgil’s Aeneid. I highly recommended Bill Cooper’s After the Flood for the serious student of history who is not afraid to give credence to the Bible’s historical account of the history of humankind.